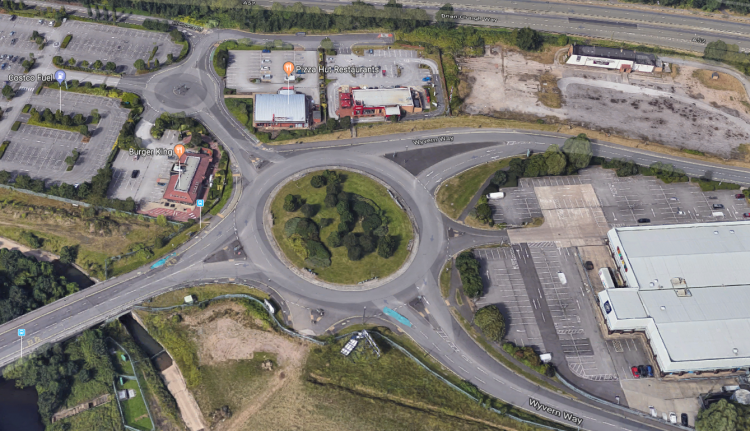 The Wyvern Way project, which was due to be constructed by Galliford Try, was a project to convert an existing roundabout to a signalised crossroads. A screenshot of the existing roundabout from Google is shown below. Cassidy Forsythe were approached by Galliford Try to create a 3d model for them from a design already carried out by the Employer. It was apparent that the design had been carried out using 3d design software, however Galliford Try had not been given a 3d model. They were only given 2d plans and long sections which were not very useful to them as some of the long sections did not even include proposed levels, even though the channels had obviously been designed and had geometry attached to them. As can be seen, proposed levels were not provided, however the geometry information was provided and a 2d cad drawing was supplied. This allowed us to measure from the cad drawing to determine some of the proposed levels. Using these levels and the vertical geometry information provided allowed us to create horizontal and vertical alignments in our new 3d model. Once we had created all of the alignments using the Bentley Openroads tools we were able to apply surface templates to the road terrain models, allowing us to create the various pavement layers. We also added kerbs to the alignments where appropriate.